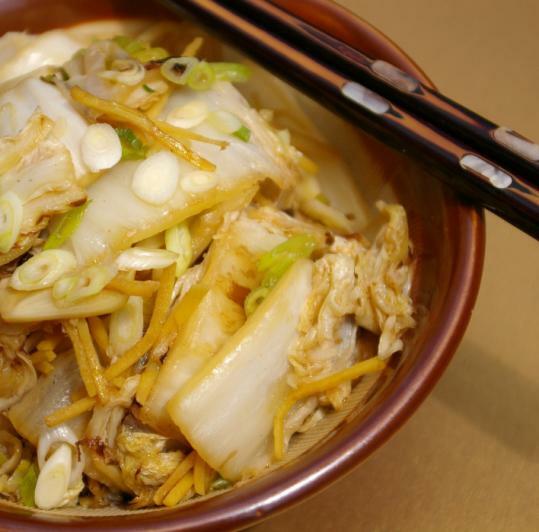 Napa cabbage, also known as Chinese cabbage, has crunchy leaves that pair well with a light sauce. Similar to bok choy, but more delicate (use either in this recipe), Napa cabbage is more elegant than regular firm-headed green cabbage. Slice the head of Napa lengthwise in half and remove the core. Roughly chop into 2-inch pieces. Then cook the cabbage in a searing hot skillet - high heat is essential - to caramelize the leaves. Saute in two batches so overcrowding doesn’t steam the vegetables. It’s fast and good for you. 1. In a large skillet or wok, heat 1 teaspoon of the vegetable oil . When it is very hot, add half the cabbage. Cook, stirring constantly, for 3 minutes or until leaves begin to brown. Remove them from pan. Use 1 teaspoon of the remaining vegetable oil to cook the remaining cabbage in the same way; remove from the pan. 2. Add the remaining 1 teaspoon vegetable oil to pan. Cook the garlic and ginger, stirring constantly, for 1 minute. 3. In a small bowl, stir together the water and cornstarch. Stir the soy sauce into the pan. Add the cornstarch mixture and bring to a boil. 4. Return all the cabbage to pan, stirring well to coat it all over. Cook, stirring often, for 5 minutes or until the cabbage is tender.